The British & Irish Lions drew first blood in their three-Test series against Australia with an epic 23-21 victory at the Suncorp Stadium in Brisbane on Saturday night. Man of the Match: Israel Folau may have ended the game on the losing side but his two-try performance on what was his Test debut was sensational. His talents are well-known but he deserves immense praise for making a seamless transition to the international stage. Electric and industrious in attack, he also wasn't work shy in defence with one notable try-saving tackle on Lions winger George North - their match-up in the coming weeks will arguably be worth the price of admission alone. Key Moment: The loss of replacement centre Pat McCabe to yet another neck injury - having only just recovered from a similar complaint - served as a body blow to their hopes for victory and a series triumph. With fellow centre Christian Lealiifano having already been stretchered from the field, flanker Michael Hooper was moved into midfield and the Lions capitalised with fly-half Jonathan Sexton orchestrating a crucial try for Alex Cuthbert that exploited the make-shift defensive line. Lions centre Brian O'Driscoll arguably checked Australia fly-half James O'Connor as he attempted to scramble in defence but the Television Match Official saw nothing wrong and the score stood. Hero of the Game: George North's try was one of the greatest ever scored by the Lions and will live long in the memory - it also gave the lead and the belief that they could win this game. A poor clearance from Australia's Berrick Barnes was swallowed up by North who ran the ball straight back at the Wallabies. His power and pace carried him past Pat McCabe and then James O'Connor before he stepped Barnes. He tarnished his score with his finger-wagging at Will Genia as he crossed in the corner but even that disappointing act cannot detract from a truly great score. Villain of the Game: The Wallabies' shortcomings from the kicking tee cost them this game - three from seven penalties and one out of two conversions proved very costly. They were unlucky to lose centre Christian Lealiifano - reportedly their designated kicked - in the opening minute of the game but that does not excuse fly-half James O'Connor's woeful form with the boot. A talented and able international playmaker like O'Connor should be making those kicks and if he had then Kurtley Beale's last-minute slip when lining up what would have been a match-winning penalty would have been irrelevant. Talking Point: The Wallabies were desperately unlucky to see three players stretchered from the field and replacement Kurtley Slip as he attempted to land what would have been a match-winning - and makeable - penalty in the dying moments of the game. As the game took its toll they were forced to move flanker Michael Hooper into the centres - a change that was ruthlessly exploited by the Lions. The fact that that home side were still in the contest up until the final whistle is a credit to their class and they are sure to raise their game for the second Test. 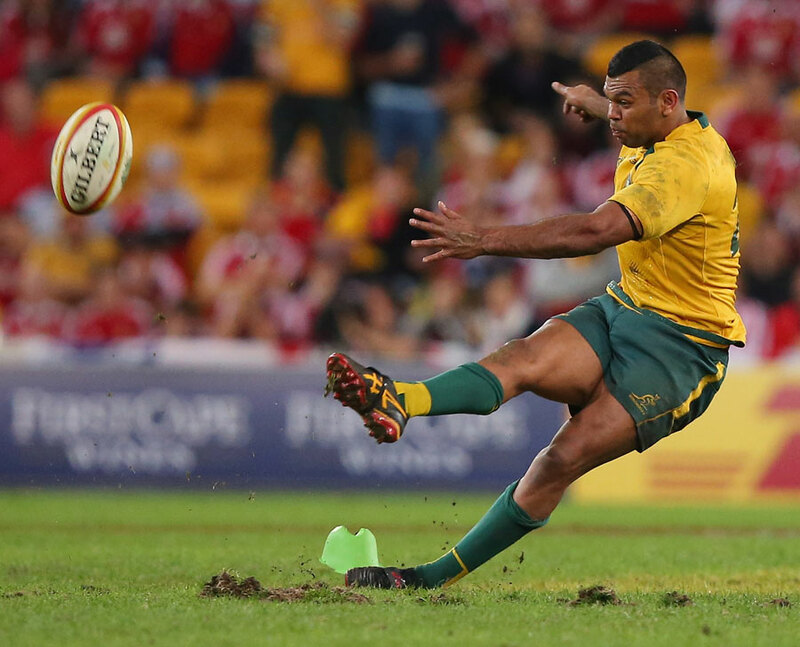 Play of the Game: Australia produced the most stunning move of the game with scrum-half Will Genia at its heart. The Wallabies were on the back foot inside their own 22 having been hammered by phase after phase of brutal play from the Lions but their bravery earned them a penalty. Instead of taking stock and opting for a breather, Genia opted to tap and go with his rapid feet and even quicker mind taking him past Lions scrum-half Mike Phillips and drawing the cover defence. As the Lions prepared to pounce he dabbed the ball through for winger Israel Folau to race on to and collect before crossing for a beautifully-crafted score. 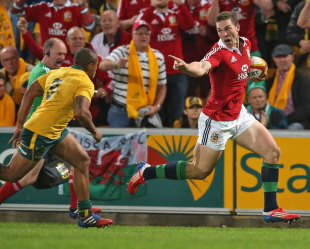 Wales wings George North and Alex Cuthbert scored tries in each half as they inspired the Lions to a pulsating triumph. North's breathtaking 60-metre solo effort will go down as one of the great Lions touchdowns, while Cuthbert pounced early in the second period. A game of brutal intensity saw three Australian players - centre Christian Leali'ifano, full-back Berrick Barnes and substitute Pat McCabe - carried off, which meant openside flanker Michael Hooper playing the final 30 minutes in midfield. But the Wallabies, mainly through a brilliant try double from debutant wing Israel Folau pushed the Lions to the limit, and they would have won if replacement full-back Kurtley Beale had kicked just one of two late penalties, the second falling short after he slipped at the key moment. Australia were ultimately punished for their goal-kicking lapses - 14 points went begging from the boot - as Beale and James O'Connor struggled for consistency. In contrast, though, Lions fullback Leigh Halfpenny landed five out of six shots, and the tourists now head to Melbourne knowing that victory next Saturday would give them a first Test series triumph since they toppled South Africa 16 years ago. It was the Lions' eighth successive Test victory in Brisbane, and they also appeared to emerge unscathed in terms of injuries, unlike their opponents. The Wallabies suffered an immediate blow when Leali'ifano was knocked out after he attempted a tackle on his opposite number Jonathan Davies. Davies immediately called for play to be stopped, and Leali'ifano saw his Test debut ended inside the opening minute as McCabe replaced him. O'Connor then missed two penalties in quick succession for Australia, but after the Lions enjoyed a concerted spell of pressure, they were undone in spectacular fashion. Scrum-half Will Genia made it all possible when he embarked on a weaving 50-metre run that left his opposite number Mike Phillips in all kinds of defensive strife. And when Genia kicked into space, Folau marked his Test debut by producing a trademark finish that underlined why Wallabies coach Robbie Deans wasted little time selecting him following his switch from rugby league. O'Connor added the conversion, but Halfpenny opened the Lions' account before North conjured his moment of magic. Gathering Barnes' kick 10 metres inside his own half, he then set off on a remarkable run that saw him beat three defenders before showboating in Genia's face and touching down for one of the great Lions tries. Halfpenny converted and kicked a penalty to hoist the Lions six points clear, and it could have been worse for Australia when North went flat out for a second try, but Folau got his hand underneath the ball. And Folau then pounced for his second try when he cut inside Sexton and handed off Lions prop Alex Corbisiero for another devastating finish. O'Connor could not convert, though, as his goal-kicking proved way short of Halfpenny's standard, and there was another blow for Australia when Folau and Barnes clashed heads, resulting in Barnes following Leali'ifano in being carried off. It meant an appearance for Beale, who was back in the Wallabies' Test 23 following his much-publicised problems with alcohol, before Halfpenny missed a penalty - only his second failure from 27 shots at goal - and the Lions trooped off 13-12 ahead. McCabe's exit early in the second period caused more disruption for Australia, and the Lions capitalised immediately when strong-running Cuthbert powered over on an angled 35-metre run. It was an outstanding finish by the Cardiff Blues predator, who has scored nine tries in 18 Tests for Wales, and Halfpenny's conversion secured an eight-point advantage. O'Connor responded by kicking a 51st-minute penalty, yet the Wallabies' injury curse struck again when McCabe departed nursing a neck injury as problems mounted for Australia coach Robbie Deans ahead of next Saturday's second Test in Melbourne. Beale and Halfpenny then exchanged penalties, making it 23-18, before Beale landed another three-pointer after he ran deep into Lions' territory, setting up a gripping final 12 minutes. Mako Vunipola conceded a penalty five minutes from time that threatened to give Australia a lifeline, but Beale sent his kick spiralling wide and the tourists escaped, and he missed again with the game's final slice of action from almost halfway, slipping as he made contact with the ball, meaning the Lions could celebrate.